Kenny Rampton joined the Jazz at Lincoln Center Orchestra in 2010. He also leads his own sextet in addition to performing with the Mingus Big Band, The Mingus Orchestra, The Mingus Dynasty, George Gruntz’ Concert Jazz Band, and The Manhattan Jazz Orchestra (under the direction of Dave Matthews). In 2010 Rampton performed with The Scottish National Jazz Orchestra at the Edinburgh International Festival, and was the featured soloist on the Miles Davis/Gil Evans classic version of Porgy and Bess. He toured the world with The Ray Charles Orchestra in 1990 and with the legendary jazz drummer Panama Francis, The Savoy Sultans, and The Jimmy McGriff Quartet, with whom he played for 10 years. 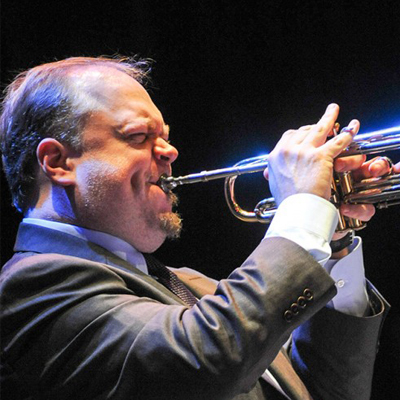 As a sideman, Rampton has performed with Mingus Epitaph (under the direction of Gunther Schuller), Bebo Valdez’ Latin Jazz All-Stars, Maria Schneider, the Afro-Latin Jazz Orchestra, Charles Earland, Dr. John, Lionel Hampton, Jon Hendricks, Illinois Jacquet, Geoff Keezer, Christian McBride, and a host of others. Most recently, he was hired as the trumpet voice on Sesame Street. Some of his Broadway credits include Finian’s Rainbow, The Wiz, Chicago: The Musical, In The Heights, Hair, Young Frankenstein, and The Producers.